Hawaii is home to some of most beautiful beaches in the world. The Island has almost all types of beaches. If you are planning a trip to Hawaii, check this list of 9 most beautiful Hawaiian beaches. Hapuna beach is one of the most beautiful white sand beaches in the Big Island of Hawaii. It is a part of Hapuna beach, State Park. 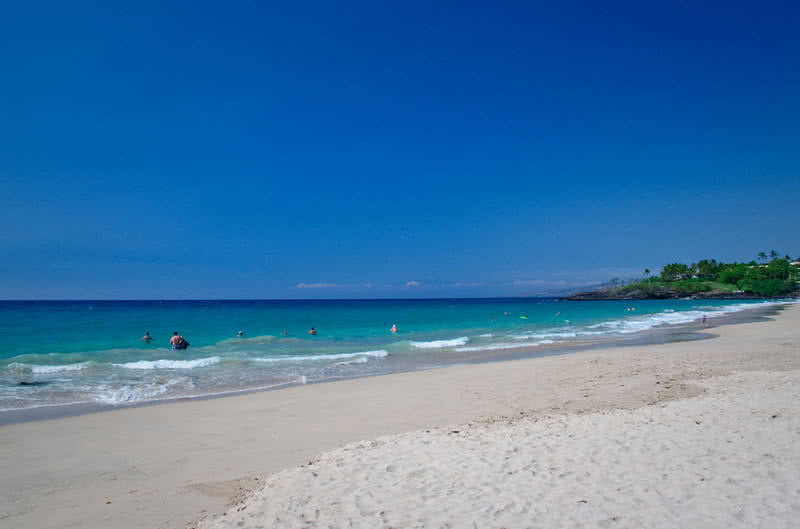 The 1/2 mile long Hapuna beach has the long stretch of beautiful white sands and clear, calm and warm waters. So the beach offers excellent swim condition for the visitors. The beach provides all kinds of amenities including restrooms, showers, picnic tables, toilets and parking area. You can also find lifeguards on duty at this beach all time. Undoubtedly a great beach for relaxation, swimming, snorkeling, volleyball and boogie boarding. Apart from the wide range of activities, the Hapuna beach is also one of the best beaches in Hawaii to enjoy stunning Sunsets. There is a number of amazing hotels and resorts near the Hapuna beach. So that you don’t have to worry about the accommodation and food. 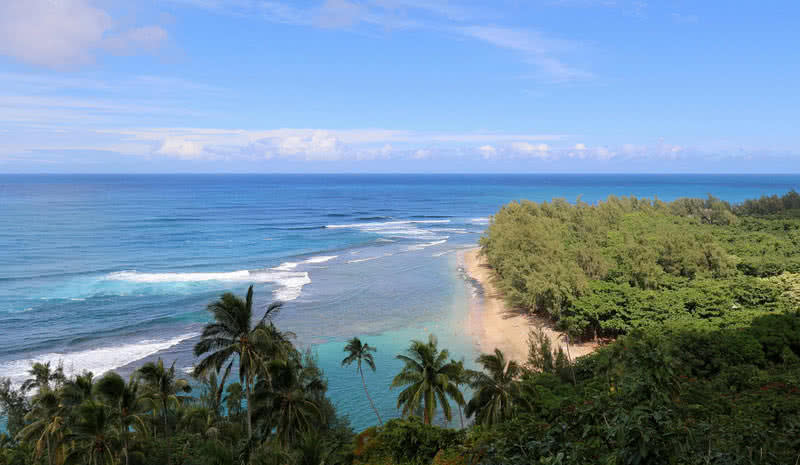 The beautiful Ke’e beach located on the Northern end of Kauai Island. In fact the end point of Kuhio highway in the Island. Ke’e beach is a part of great Ha’ena State Park which includes amazing trails, ancient Hawaiian sites and sea caves. Protected by the coral reefs, this beach is famed for its clear calm waters. It provides excellent swimming condition for the visitors. The amazing Ke’e beach is perfect for relaxation, swimming, beach walks, snorkeling, scuba diving, and paddling. The beach provides amenities like toilets, parking places, and showers. Surrounded by vivid orange-red colors, the Sunset at the Ke’e beach is a don’t miss sight during your visit. The famous, 11 miles long Kalalau trail start from the Western end of the Ke’e beach. This trail will bring you to amazing Kalalau valley at the Northwestern part of Kauai Island. This gorgeous beach is a part of Makena State Park located in the South of Wailea region of Maui Island. 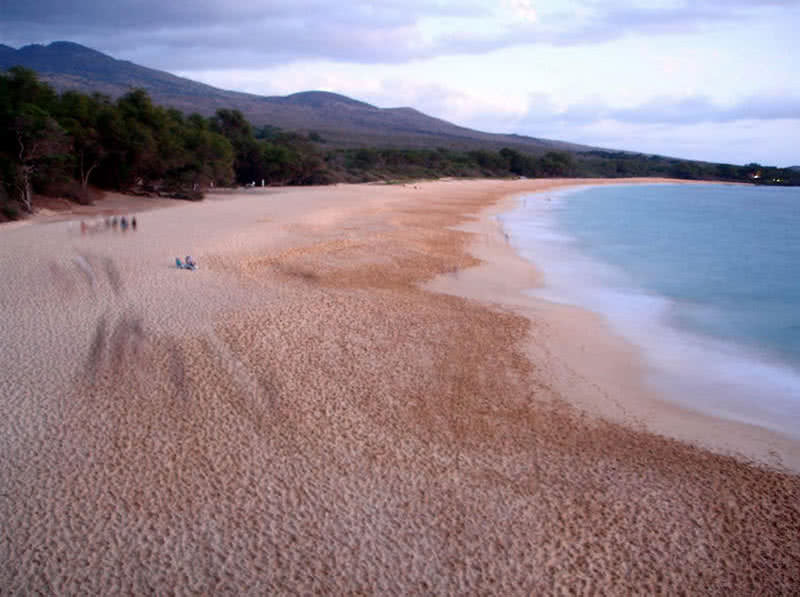 The Makena beach is also known as Big beach. The 1.5 mile long, 30 meters wide Makena beach is famed for its beautiful golden sands and clear, pristine waters. In addition, Makena beach features 330 sunny days in a year. The Makena golf resort located on the shore of Makena beach is an amazing beach front resorts that offers all kinds of amenities restaurants, coffee house, fitness centers, free Wi-fi, shopping centers, bike rentals, parking places, tennis courts and gold. From this resort, you will get an excellent view of Makena beach. Unquestionably Makena is one of most beautiful beaches in Hawaii. But you should be aware of the huge waves of this beach. Always follow the instructions from the lifeguards on service. The experienced operators provide snorkeling and kayaking experience for the visitors in the beach. Beautiful Sunsets are another great sight you can enjoy at the Makena beach. A must visit spectacular beaches in Honolulu county of Oahu Island. It is one of great attractions of 35 acre Kailua Beach Park. 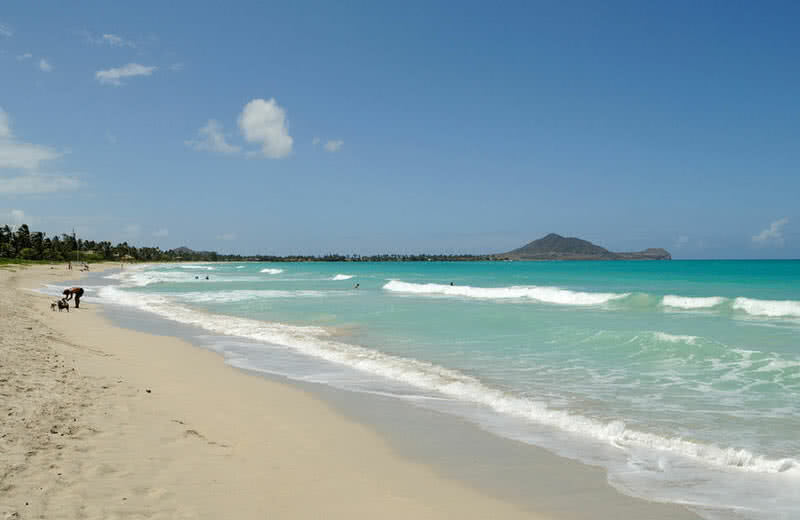 The beautiful Kailua beach stretches over ½ miles with white, powdery sands and crystal-clear turquoise waters. It is a great beach for family and children. 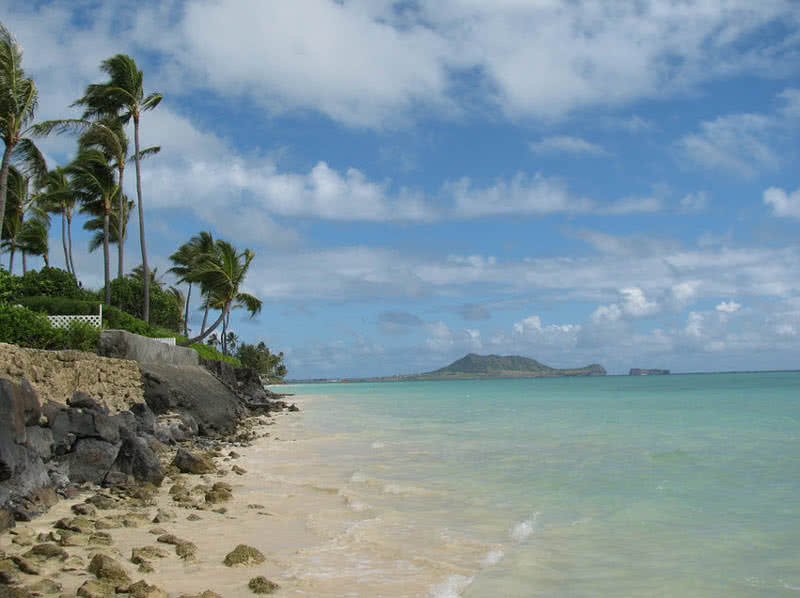 As the waters of Kailua beach is relatively calm, you could swim here fearlessly. Enjoy walking, swimming, surfing, snorkeling, boogie boarding, kayaking and stand up paddling in the pristine waters of Kailua beach. With lots of trees, the Kailua park provides plenty of shady areas. The amenities that the parks offer for the visitors also includes BBQ pits, showers, picnic tables and volleyball courts. Kaanapali beach is a popular, busy beach located in the Western part of Maui. This gorgeous beach has over 3 miles of white sands and crystal clear waters. Kaanapali beach is also known as Keka’a beach and canoe beach. There are many resorts and hotels along the Kaanapali beach. These beach resorts will provide classic rooms, bars, fitness centers, pools and other amenities for you. Kaanapali is a great beach for watersports lovers. The beach offers outstanding scuba diving, snorkeling, kayaking and sailing experience for you. Take a boat cruise on Kaanapali beach to spot amazing whales. Kaanapali beach is one of the finest spots in Hawaii to watch Sunsets. Punalu’u beach is the most beautiful black sand beach in the U.S State of Hawaii. It is also known as ‘Black Sand Beach’. It is the flowing of lava into the ocean result in the creation of beautiful black sands of Punalu’u beach. 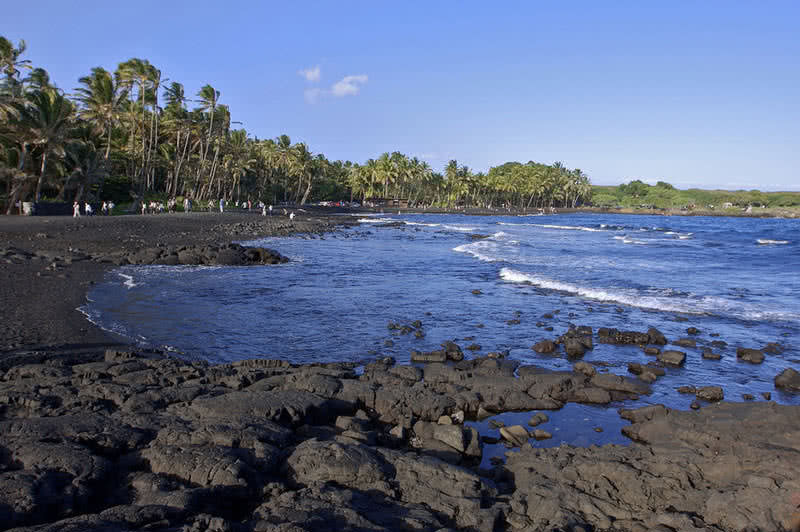 The black sands itself is the main attraction of Punalu’u beach. It is definitely a great sight to behold. But keep in mind that, removing black sand is prohibited here. Lined by the tall palm trees, the Punalu’u shoreline offer plenty of shady places. The Punalu’u shoreline is rocky and swimming here is not safe because of strong currents. However, it is a great beach to photograph and walking. See the endangered Hawksbill turtles and Hawaiian green turtles basking on the shore. Punalu’u beach offers facilities including free parking, showers and toilets. The half-Moon shaped Hanalei bay located in the North shore of Kauai is the largest bay on the Island. The beautiful wind sand beach at this bay is over 2 miles long and 125 feet wide. It is truly the most beautiful beach in Kauai Island with majestic mountains in the background. The 300-foot pier may be the first thing that catch your attention at the beach. Near the pier, the waves are not so strong so that anyone can swim fearlessly there. This pier is also used for fishing. A great place for surfing and bodyboarding. The beach also offers activities like sailing, paddling and kayaking. 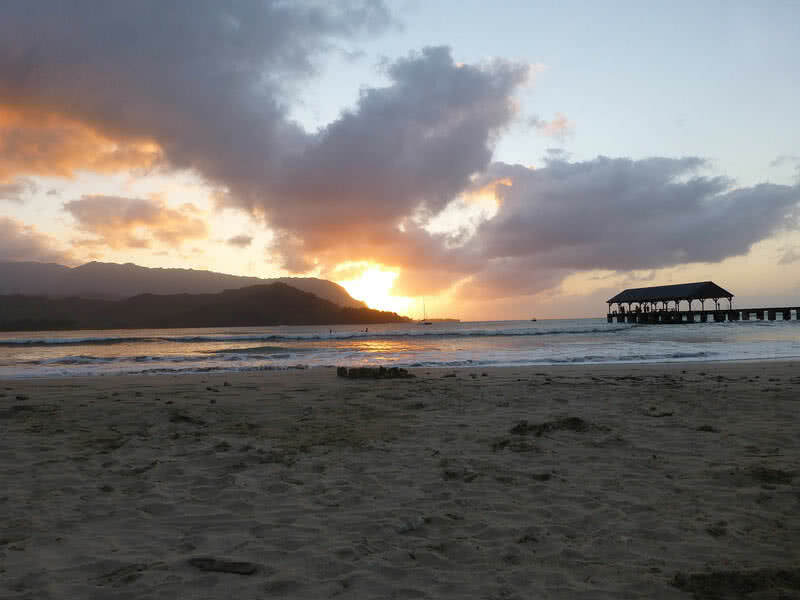 Hanalei beach is also famous for amazing Sunsets. Hanalei beach is not a good place for snorkeling because the coral reefs are only found at ends of the bay. Offers facilities including restrooms, parking places and showers. Perhaps the most beautiful beach in the Island of Oahu. Located on the Southern part of Honolulu county of Oahu, the Waikiki beach is famed for its 2 miles stretch of white sands and crystal clear waters. It is also one of the busiest beaches in Hawaii. Waikiki is actually a series of beaches – Duke Kahanamoku beach, Fort DeRussy beach, Gray’s beach, Waikiki beach and Kuhio beach. The name ‘Waikiki’ in the Hawaiian language means ‘Spouting fresh water’. As the name suggests the waters of Waikiki beach are clear, warm and calm. Waikiki beach is an ideal place for surfing and swimming lesson as its waters are calm. Walking, sunbathing, outrigger canoeing, stand-up paddle boarding, and snorkeling are other popular activities at the Waikiki beach. Visit the amazing ancient volcanic crater called ‘Diamond head crater’ in the Southern part of Waikiki. The 0.75 hike to the crater’s rim can be quite challenging. But from the top you can enjoy the breathtaking view of Waikiki beach. 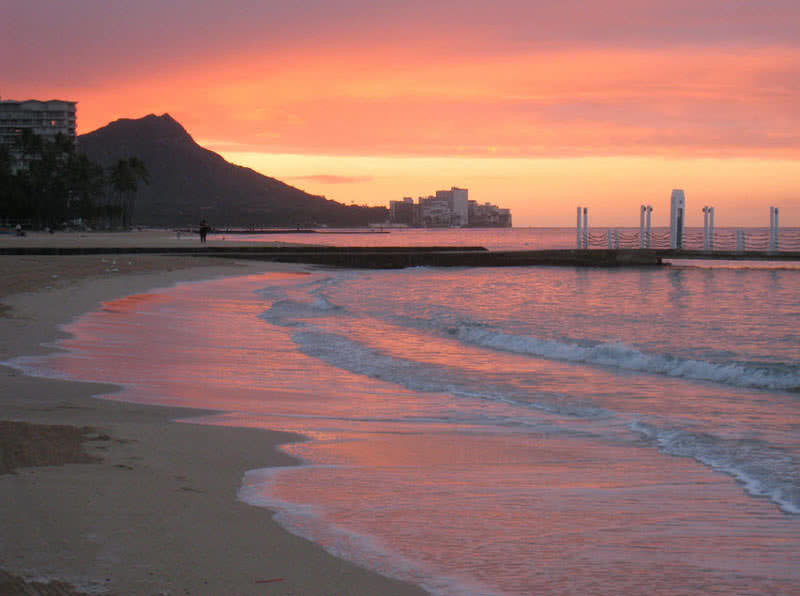 There are many world-class resorts and hotels situated along the Waikiki beach. As there are plenty of options to choose, you can easily find a room that fit your budget. The Hawaiian name ‘Lanikai’ means ‘Heavenly sea’. With a ½ mile of soft white sands and clear aqua blue waters, the Lanikai beach is as beautiful as its name suggests. This gorgeous beach is located in the windward coast of Oahu. Protected by the reefs, the Lanikai beach provide ideal swimming condition for the visitors. The beautiful Lanikai beach is one of most popular photo shoot spots in Hawaii. There are two beautiful Islets located offshore at Lanikai beach. They are called as Na Mokulua or Mokes. The South Mokula Islet is a bird life sanctuary protected by the Hawaiian government. You can take an adventurous kayak to these beautiful Islets. It is one of the most thrilling activities in the Lanikai Beach. Lanikai is an ideal beach to watch stunning Moonrise and Sunsets. Lanikai beach is a paradise of water sports. Here you can enjoy swimming, canoeing, surfing, sailing, kayaking and windsurfing.